An attractive new pocket-size book of short, circular walks along the Dorset ‘Jurassic Coast’ section of the South West Coast Path arrives on UK bookshelves this week. The first book in a five-book series which will cover the complete 620-mile long South West Coast Path, Dorset’s ‘Jurassic Coast’ takes walkers on ten of the absolute best short circular walks between Lyme Regis and Poole Harbour. At just £6.99, it’s the perfect impulse buy. The handy title is part of the popular, UK wide Top 10 Walks series from outdoor specialists Northern Eye Books. With detailed information for each walk, accurate numbered directions, enhanced Ordnance Survey mapping, stunning photography and fascinating interpretation along the way, these guides set a new standard in clarity and ease-of-use. 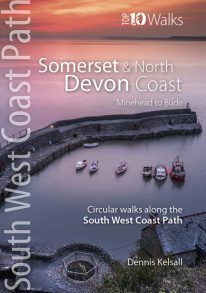 To browse the full range of Top 10 Walks books and Official Guides to long distance UK trails including the South West Coast Path, see: www.northerneyebooks.co.uk. Featured walks include: 1. Golden Cap, 2. Chesil Beach & Abbotsbury, 3. Portland Bill, 4. Ringstead Bay, 5. Durdle Door & Lulworth Cove, 6. Kimmeridge Ledges, 7. St Aldhelm’s Head, 8. Dancing Ledge, 9. Durlston Head, and 10. Old Harry Rocks.